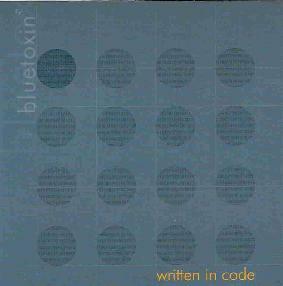 Bluetoxin - "Written In Code"
On the other hand, the group has its esoteric moments, too. Songs like “All the Ants” and “Numbers” feature dense, melodic keyboard arrangements and angular guitar rhythms that remind one of Simple Minds and Magazine at their avant-punk best. The machine-like synth grooves of these songs, as well as several others, place Bluetoxin in the rarefied atmospheres of post-punk dream wave where they show a definite flare for nouveau romantic melodrama—elegant yet visceral enough to make you want to get up and dance. The pieces that show a too marked influence of house and ambient textures (“Too Late Somehow” and “Binary,” for instance) are the least effective songs on Written in Code. The group, however, does occasionally venture into exotic, Japan-influenced territory, especially on “I am Tame”; its dreamy Fender Rhodes and gurgling synthetic backdrop create the perfect mise en scene for jaded technocrats and the jetset of the third millennium. Palatable and easily enjoyable, Written in Code benefits immensely from a firm though transparent production hand, and there’s every reason to believe that on future releases Bluetoxin will transcend the sum of its influences. For more information you can visit the Bluetoxin web site at: http://www.bluetoxin.com.